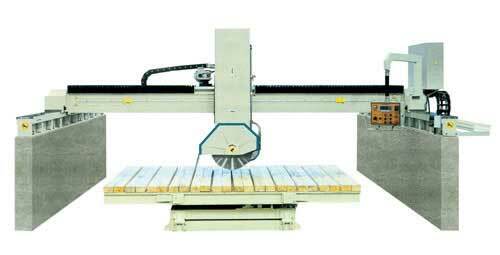 This bridge saw is laser bridge cutting machine, which is PLC controlled with cutting dimensions set by terminal input. All operation are executed either manually by the operator or automatically by the program carrying out parallel cuts with max 8 different dimensions repeatable up to 1999 times. The switchboard on the laser bridge cutting machine, with operation buttons, programmer and liquid crystal display on it, is mounted on the right hand side of the machine. The switchboard make operator easily to control the machine from the sawing area when the stone is being positioned. The saw is equipped with a laser illumination system to aid in lining up the cut. The most important is the blade holder of laser bridge cutting machine can be tilting from 0 to 45 degree for chamfering cutting. So the stone cutting equipment can be satisfy for different special processing request. The cut is controlled through an inverter. The bridge saw features high strength, deformation resistance and long service life. It is easy to transport and free of experiment and adjustment. With rotatable cutting head, the laser bridge cutting machine has the merits of high speed, high precision and easy maintenance, which is preferred equipment for cutting high-value large-size slabs. Yuxiang is a specialized manufacturer of stone cutting equipment, including bridge cutting machines, bridge saw, stone cutting equipment, laser bridge cutting machine, infrared bridge cutting machine, overhead bridge cutting machine, edge cutting machine, floor cutting machine, stone cutting machine, stone cutting saw.